You own a business that relies on vehicles to reach your clients in order to do what you do best. Don’t entrust the care of those cars, trucks or SUVs to just anyone — call on the automotive specialists at TransMedics, your source for premier fleet services in Raleigh, NC. Our team is versatile enough to handle all types of commercial fleets, from limousines to trucks to compacts and more. Routine inspections of the vehicles in your fleet save you time and money in the long run by helping you avoid preventable major issues. Our team will inspect tires and adjust air pressure, as well as check all fluids, brakes, belts, hoses, lights, drivetrain and suspension. Keep your entire Raleigh-area fleet up-to-date on scheduled maintenance, which includes oil changes. We even offer longer-lasting synthetic oil upgrades that will help extend the life of your vehicles. 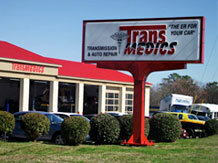 Manufacturers knows their cars like the backs of their hands — luckily, so do the mechanics at TransMedics. Honda. Toyota. Ford. Chevy. Mazda. Jeep. Dodge — it doesn’t matter. We can provide factory-recommended service for all makes and models, which includes: cooling system flushes, air filter replacement, fuel filter replacement, transmission service, power-steering service, tire rotation and more. We can take care of your entire fleet from top to bottom! Our range of services runs the gamut from simple oil changes to complete engine replacement. Insurance Paying for What Ails Your Car? Let TransMedics Handle It! For a free quote, contact us today. We help car owners from all over the Triangle — how can we help you?